What information do you gather from subscribers to your email update service? We gather your email address only. We use your email address to send out occasional newsletters about special promotions and new products at the Tea Masters Ceylon (Pvt) Ltd. site. You may unsubscribe from this service at any time. What information do you gather from customers (those making a purchase)? We gather your name, email address, and postal address, which are used to fulfil your order. We keep these details in a secure area of our system to make ordering easier the next time you visit. We at no time collect or store your credit card details. What information do you gather from questionnaires and competitions? We will gather your email address to advise you if you have won a prize. We may also ask for other information such as gender, age and country. No respondent is identified as an individual. We use this information in an aggregated form only to help us enhance our website and our range of products. What if I contact you? In order to transfer payment for your order, your credit card details will be sent in encrypted form to your bank for clearance. This happens during the checkout process via the PAYPAL payment processing system. Your name and address will be supplied to our transportation company so your order can be delivered. Under What Circumstances Will You Contact Me? If you have elected to, you will receive an email confirming placement of your order. If your order, for whatever reason, cannot be shipped within 7 working days, one of our customer service representatives will contact you via email / phone. If your order does not contain enough information (eg address details) for us to complete it, one of our customer service representatives will contact you via phone / email. If you have elected to, you will receive an email confirming shipment of your order. If you have elected to, you will receive occasional email newsletters from us. You may cancel these at any time. We may contact you and pass on your details to third-parties if we believe you have violated the terms and conditions associated with using Tea Masters Ceylon (Pvt) Ltd., or, we believe you to be involved in activities harmful to Tea Masters Ceylon (Pvt) Ltd. or other users of Tea Masters Ceylon (Pvt) Ltd. website. When a visitor gives us their e-mail address, or sends us e-mail correspondence, we retain their e-mail address. We do not share our e-mail lists with third parties for marketing purposes. We use e-mail addresses to communicate with you regarding your orders and other matters regarding transactions between us or your customer relationship with us. We may also use your e-mail address to share information about Tea Masters Ceylon (Pvt) Ltd. products and services that may be of interest to you. You may opt-out of receiving such promotional messages from us at any time. If we do send you a promotional e-mail, you will be given the opportunity to decline receiving similar e-mails in the future. • Sell, trade or rent any of your personal details to any other company or organization. • Send you promotional email unless you have requested it. What are the different types of teas ?What about herbal teas ?Where does tea come from?What gives Ceylon tea its distinctive flavour ?What climatic factors influence the growing of tea ?How is tea processed ?How much caffeine does tea contain ?What are the effects of caffeine ?Why has tea remained such a labor intensive product ?What differentiates Hedley's from other multinational tea sellers? The three main categories are green, black, and oolong and come from the same plant species. They are differentiated by their oxidation levels as a result of the different processing methods. Black teas are the most oxidized, Oolong less and Green teas are not oxidized at all. plant. Tea is primarily grown in Sri Lanka (Ceylon), India, China, Kenya and Japan. The teas from these countries are further classified according to the region they grow in. Ex. Nuwara Eliya, Kandy, Dimbula, Uva in Sri Lanka, Darjeeling, Nilgiri, Assam in India. The distinctive characteristics of flavour, aroma, and color of Ceylon tea is the outcome of the unique climatic conditions, the varying altitudes and soil setting found in each tea growing region of the country. Rainfall - The Island enjoy two prolonged rainy seasons; the north-east and south-west monsoons respectively. The rainfall coincides with the customary sunny periods across the tea growing regions. Temperature – The altitude and the location of the land has a large impact upon the temperature-climate for tea growth. (Example, the upland districts (3,500 – 7,500 above sea level) of Sri Lanka have temperatures of 16°C compared to the lowland (1,500 – 1,800 ft above sea level) temperatures of 27°C. The leaves are now twisted and rolled by both hand and machine so as to break up the leaf cells allowing the oils and enzymes to be released. Here the leaves are allowed to ferment under humid conditions causing the leaves to turn brown or black in color. The oxidation time is a contributing factor that determines if the teas remain Black, Green or Oolong. The leaves are dried evenly whist halting the oxidation process. This process is considered the main determining factor of the tea type to be produced. The Black tea process goes through all the above stages. Oolong goes through a similar process with the oxidation period being half that of black tea. The process for making green tea is the shortest, where after the withering procedure; the leaves are fired to prevent oxidation from taking place. 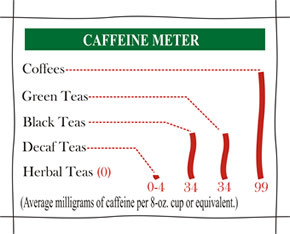 Since it is a stimulant, caffeine increases alertness and quickness of response, and often briefly improves mood. Hedley’s Teas comes from some of the finest tea plantations in the country. It is uniquely different from other teas because it is packed within hours of being processed thus making certain optimum freshness is preserved while the value addition is also done totally in Sri Lanka itself. Thereafter it is sold directly to the retailer who in turn sells it to the end customer. What differs with Multi nationals is that they buy poor quality tea in bulk from various tea producing destinations around the world, add minimum value before letting it pass through a lengthy distribution chain, sometimes taking months before reaching the retailer andthe end customer. This clearly shows that Hedley’s Tea is 100% Pure Ceylon, packed garden fresh from right where it is grown.